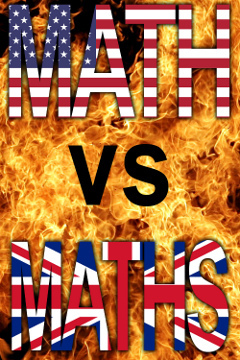 In a historic treaty, the British and American Government have finally reached a compromise and agreed a common usage on the rival abbreviations for the word "Mathematics." While in the United States, it is typical for people to use the word "Math", British citizens more commonly use the form "Maths" leading to heated debates on Internet bulletin boards, Social Media websites, comments sections and other high profile discussion forums. "Holy crap, not this debate again!" American Chuck Hankman reacted, "Maths just sounds stupid and cumbersome. You're taking all the letters from the end off, why stop with the last one." "Don't these Americans know anything?" Briton Keith Wilson retorted, "It's Mathematics, a plural. So the abbreviation should be pluralised too. We invented the language, so use it proper." "But since when do you have 'one Mathematic'" Hankman countered, "You don't, do you. And I hear you British people abbreviation 'aerodynamics' to 'aero' � so you could at least try to be consistent!" While there is zero evidence of any suicide Maths bombers, the Pentagon has done the Math and determined that zero is a real number and therefore so is the threat. With such well-reasoned arguments taking place all over the Internet, the British and American governments realised that the gulf was only going to grow, the anger ferment and the danger of outspoken preachers radicalising their followers leading to reprisals on overseas students. "From this day forwards, when the abbreviation is being used to describe a single field of Mathematics, then the American form 'Math' will be used. When it is used to refer to multiple disciplines, the British form 'Maths' will be used instead. "For example, if you were working out a tip, you would tell your friend 'You do the Math' � because only one branch of Mathematics, arithmetic, is being used. "If, however, you needed to work out the trajectory of a cannonball being fired from an angled turret, then you would say 'You do the Maths' � because multiple branches of mechanics, mechanics, trigonometry and arithmetic would all be required." The reaction on the Internet was initially positive with a series of T-Shirts being produced to promote the new correct usage. "I think it's great," Chuck Hankman explained, "It's great that these sorts of arguments are finally behind us. And I'm definitely getting a T-Shirt, in red, because that's my favorite color." "Jesus," Keith Wilson replied, "There you bloody Yanks go again... it's favoUrite coloUr."